French president defends international cooperation at U.N.
Emmanuel Macron vowed to press on with the Paris accord and said his country will not close the doors to dialogue with North Korea. In his first appearance at the U.N. General Assembly, Macron vowed to press ahead with the Paris accord to combat global warming, although the United States has said it is withdrawing. He also said France won’t “close any door to dialogue” with North Korea and that it would be “a grave error” to unwind the 2015 nuclear deal with Iran as it faces strong criticism from U.S. President Trump. Macron also called for investing in education and health, and he proposed appointing a U.N. representative for press freedom. 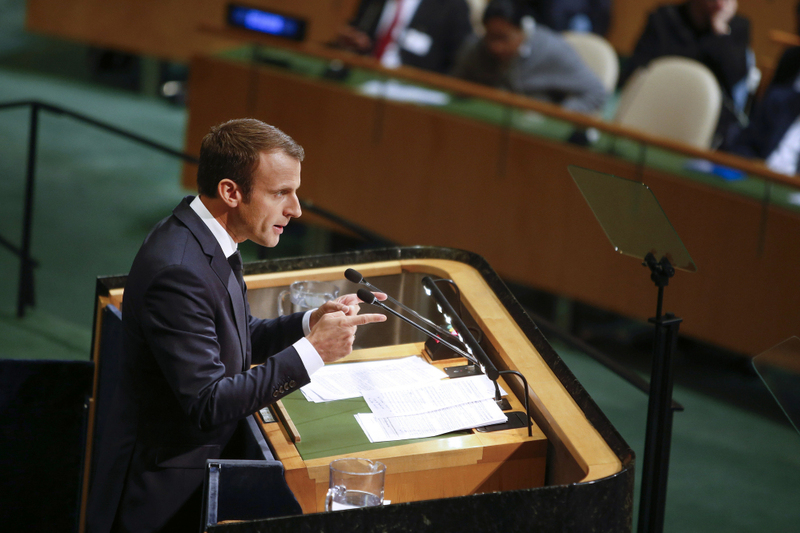 Seven decades after the end of World War II and the creation of the United Nations, international bodies are confronting doubts, Macron said. “We have allowed the idea to proliferate that multilateralism is a kind of game, a game for diplomats sitting around a table,” he said, but have come up short on addressing such major threats as climate change. “Today, more than ever before, we need multilateralism” to work on that and other global issues, such as war and terrorism, Macron said. Macron presented a counterpoint to Trump, who in his own debut speech at the General Assembly a few hours earlier had urged countries to embrace their own “national sovereignty” to do more to ensure their own prosperity and security. Trump had tough words for North Korea, threatening to “totally destroy” the Asian nation if the U.S. is forced to defend itself or its allies against aggression, and also for the Iran pact, which he called “an embarrassment” to the U.S. He hinted that his administration could soon declare Iran out of compliance with the deal, which could unravel it. His message in his first state-of-the-world report since taking the reins of the United Nations on Jan. 1, was implicitly directed at North Korean leader Kim Jong Un, but also at Trump. The two have traded tough rhetoric amid Pyongyang’s continuing nuclear and missile tests. Guterres said there are seven threats and tests that stand in the way: nuclear peril, terrorism, unresolved conflicts and systematic violations of international humanitarian law, climate change, rising inequality, unintended consequences of innovation, and people on the move. These issues are expected to dominate the six-day meeting. On day one, however, the spotlight was on Trump and Macron. He said all responsible nations must work together to confront terrorists and Islamic extremists that inspire them. And “it is time to expose and hold responsible” nations that provide funding and safe harbor to terror groups, Trump said. He spoke after Guterres and Brazil’s president, who for more than 35 years has been the first leader to address the 193-member General Assembly. Brazilian President Michel Temer, charged last week with obstruction of justice and leading a criminal organization, continued the tradition. But Temer said it is imperative to reform the U.N., particularly to expand the powerful Security Council to align it with the reality of the 21st century. Brazil is part of a group with Germany, India and Japan seeking permanent seats on the council. Not far behind North Korea on the list of issues needing urgent international attention is the plight of Myanmar’s Rohingya Muslims, victims of what Guterres called a campaign of “ethnic cleansing” that has driven nearly 400,000 to flee into Bangladesh in the past three weeks. Myanmar leader Aung San Suu Kyi, who canceled plans to attend the General Assembly in a decision widely seen as a response to international criticism, earlier Tuesday defended the government and said her country does not fear international scrutiny. She invited diplomats to see some areas for themselves. Guterres told leaders in his General Assembly address that “I take note” of Suu Kyi’s speech. The world leaders gathered as Hurricane Maria, a Category 5 storm, smashed the small Caribbean nation of Dominica with 160 mph winds. It ripped the roof off even the prime minister’s residence and caused what he called “mind-boggling” devastation. The storm was on a track to strike Puerto Rico on Wednesday. On Monday, Guterres and top government officials from several countries devastated by the other Category 5 storm, Hurricane Irma, addressed a hastily called U.N. meeting and appealed for help to rebuild following that storm’s destruction. Guterres has repeatedly focused on the challenge posed by climate change.